I checked out Body Be Well Pilates Studio in Red Hook last Wednesday. I have a friend who tells me that pilates has transformed her life so I am curious, and would like to take a few different pilates classes. I bumped into a Rhinebeck acquaintance who had just left the earlier class when I arrived for my 10 am Wednesday mat class. I think most of the women in my 10 am class were regulars, and I had to smile when the woman on the mat next to mine asked me if this was my first time. Chelsea Streifenede, the owner of Body Be Well, led our class and guided us through work with exercises using the circle. We squeezed the circle with different limbs to tone different areas, and then we did teasers, and a few exercises where we kind of rolled back and forth. About half way through the 60 minute class, I realized that it’s not as easy as it looks. Even though, I wasn’t sweating profusely as I do in yoga or my indoor cycling class, I was definitely feeling it in certain muscles, mainly my arms and abs. Body Be Well has a cute little boutique where you can buy cool pilates tank tops and other accessories. 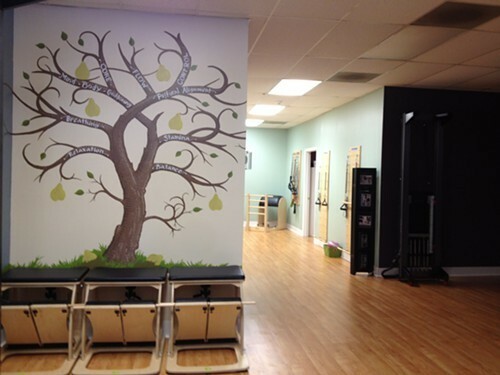 Streifenede also teaches a Pilates Sports Center Teacher Training Program at the studio. Next week I will be trying out a Group Reformer class. Stay tuned! I may become a pilates convert. Writer Vanessa Geneva Ahern has been blogging about all the good stuff she finds in the Hudson Valley since January 2009 at HudsonValleyGoodStuff.com. Follow her blog on Facebook, and sign up for the HVGS newsletter to find out more.